Hello friends!! Thank you for dropping by. I’m glad you’re here. Wondering what this ‘magnanimous’ word is all about? Well, the name of my blog ‘Magnanimous Word’ just came by, like some revelation. Probably because words have always fascinated me. Word is divine – most religions say that. Word is a bond – giving a word implies commitment and people die for their word. Words have great power to hurt or heal. They can break it or make it. In the form of compliments and praise, words can build someone up. By way of insults and humiliation, words can tear someone down, sometimes for the full life. Words can inspire and motivate. Our actions, that cause revolution and change the world have their seeds in our thoughts, ideas and words. If words have so much power to change the world, then writers should make sure it is a positive change. Let’s keep our words generous and abundant in giving, forgiving, inspiring and sharing, while we entertain others and keep them engaged. And that’s what I try to do through my blog – by using words that convey truth, humour, sadness, romance, inspiration and much more. A huge variety of themes, social messages, feelings and emotions can be seen in my writings – poems, stories, musings, articles. I’m equally comfortable in all genres. Most of the posts are my creation – my own words and pictures. Very occasionally I bring in other people’s stories and thoughts to inspire you. In this case, I fully cite and acknowledge the author, poet or creator. Otherwise assume the work is mine, of course with full copyright. I write about whatever I observe in life, from my experiences and sometimes that of others. Like a proverbial cat with nine lives, have lived many lives in one single life, at least in my variety of career experiences as well as moving from one city to another, or one suburb to another which meant friends too kept on changing while extended families were left behind. All in all, a wider exposure to life often comes with wonderful gains along with losses and resultant instabilities and insecurities. I’ll share some of them with my readers so that it can inspire or guide someone in some way . Please stay a while. Check out all the stories and ideas, and feel free to give me your suggestions to improve the blog. You can now directly receive my posts on your FB news feed . 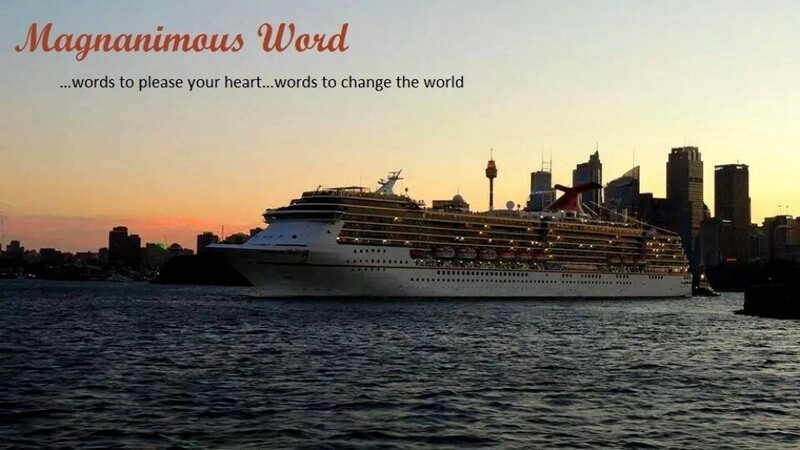 Click Magnanimous Word to connect to my FB page. Please accept my apologies for not replying to your message. I did not take any action all this time. It just happened like that. Am not very regular here so took it lightly but will try now as it is for my benefit…this award. Thanks for your compliment. Mine is a new blog and am trying to build it up while learning from all of you here. Thank you for visiting my blog, Alka! I wish you good luck with yours. Thanks for your visit as well and also for the good wishes. Welcome back anytime..
Rehearse the patterns in your head. The weight on your ankle is dead. And express your intentions, cruel and kind. Get ready for the mythical lot. And the sound that silences your thoughts . Shake off your fear and cone undone. Give yourself as the circle is one. Thanks for your lovely inspiring words. I read them properly today only as they somehow got overlooked by me. Every word is worth following. Thanks!! You have a nice blog, a deep thinking one. Thanks for the follow! 🙂 It will be a pleasure to get to know you & your blog better! Thanks Vashti 🙂 It’s been a pleasure meeting you. I reciprocate your feelings as you have a wonderful blog. Thanks a lot for nominating me for Creative Bloggers Award. Or is it actually Blog Tour Award?. Till now I have not accepted the previous offers I had for awards. But if I decide to accept award given by you, I will first finish the process with other awards and then then come to Creative Blogger. This will take a few days. Hope that’s ok.
As far as I know they are different. One asks questions on your creative process and other asks you to say some personal facts about you. Alka, are you still not getting my posts in your reader? This is Priceless Joy with Beautiful Words. It’s lovely to hear from you again. You are one of my earliest valuable friends and supporters here on Word Press when I had no one, so I had missed you all this while. No I’m still not getting them on my reader. But I’ll be watchful in future and will let you know. Okay, Alka, I will check in with them again. Thanks! I’ll do that and see how it goes. Hopefully that will resolve. Thanks for dropping by and liking my “Summer’s Delight” post. I do enjoy my morning cup of coffee, responding to replies and getting to know others by meandering their blogs. It’s the “return policy” of blogging, right? I so enjoy your words here, about words. Do take a look back at my About, and you will find out quickly, even though I am sure there is a huge age gap between us, how akin we are in our thinking. Hope you’ll enjoy meanding through my site a bit more — it is my Ode to the power of words. When my children were young (now 38 and 40), in their teriffic twos (prefer that wording rather than the stereo-typical Terrible Twos), I would say to them “Use your words!” when they would break into those high pitched screams of “Mine” or unhappiness or frustration. And now, after all these years, I find myself following the same moniker! Again, thanks for stopping by — will spend some time now meandering your site too — great word, “meandering” — almost as fun to say as “delectable”! Thanks for the lovely warm message. Thanks for appreciating my words about ‘words’. I had a look at your About and know you think like me about words. Yes, I too will ‘meander’ your site and am sure someone with such sensitivity towards words is equally sensitive towards life issues too. I enjoyed reading about your children. Even when they are grown up, for mums they are the same. We mothers remain the same but they inevitably change. Wisdom lies in accepting the change that our dear ones go through as each life is a separate journey, their own path towards progress, their own experiences in external world that we may not even know of. Those were pretty pictures you painted in my head. With a palette of words. I can almost smell your cup of coffee. And hear your toddlers throwing a tantrum. Thanks for liking my blog, and also I read your work, most of them are remarkable. People like you make this blogging world alive and empower blogger community. Keep blogging and take care. Thanks Abhishek, for liking my blog posts! I welcome any kind of feedback on my posts so that I can improve them in future. I’ll check your posts too which look great. Thanks for dropping into my site, alka, in turn enabling my access to your wonderful world of words. I am sure there exists a beautiful architecture lying in latent wait to emerge gloriously through your words and images. I hope to be a keen spectator…best wishes.. Raj. Thanks! I reached your wonderful and informative site via some other site. Indeed words are the tools that we all use to build our sites, to fulfill the very purpose of our site as well as to reach out to the world. Best wishes to you too! Hello. thanks for the like on my Singular Sensation post. I can definitely relate to nearly everything you said/feel about blogging, identifying one’s readers and ultimately just writing for the joy of it. More power to you! Thanks Julia for nominating me for this award! It’s an honor. Ever since I became active on my blog, I’ve been offered many different awards and I’m embarrassed to admit that I still haven’t answered the questions that were a part of the process. I will start the process soon as we must embrace the abundance and love that comes our way. Thanks for dropping by m blog! Oops! Thanks for dropping by MY blog! Thanks for the mention. My pleasure! I guess and hope you will come up with a wonderful post for this one! Thanks! Is there a time limit, I mean some deadlines? Do I have to start right now? there’s no time limit, no deadlines….you can start anytime…thank you and cheers! Thanks so much for the follow. I really like the tone of your About page. I will do some exploring! Thanks for liking it! Somehow I’ve always had this feeling that my About page is too solemn. Moreover it doesn’t give enough information about me. Interesting blog,Alka. Looking forward to reading your posts. Thanks Jahnavi! Please do visit again. Alka, Ive enjoyed reading the contents of your site…very interesting and helpful information. I look forward to reading more. Thank you for sharing a part of your life. Thanks Jessie for enjoying my posts. Your appreciation means a lot to me. Please do come back. I will also read the posts on your site. My apologies Ishita! I have this habit of overlooking all the awards. It just happens and I haven’t accepted any of them. That’s too bad I know. Thanks anyway, it was so nice of you to think of me. Hi, Thanks for dropping by and discovering my ‘world of words’ 🙂 Hope you like my work. Here we all are wannabe poets and writers as art can never ever attain perfection. There’s always a room to learn and improve. All the best! Do come back. Hello Rashmi, it’s great to know you too. I too read your posts from time to time and enjoy your positive outlook. Thanks for taking interest in my blog and finding my work to be creative. I do appreciate your wishes. Many thanks! Nice to meet you! I’m glad to have come across your blog. A very nice intro. I like the way you have written about the words. Thanks for dropping by and for all the nice words you’ve written about the words I wrote about words. You too have a great day! Welcome back anytime. Nice Blog… Best Wishes Always! Thanks for dropping by and appreciating! Any suggestions to improve its appearance and content are welcome anytime. Many thanks for including my blog in your Bliss List. I feel honored. Great About – love your take on Words. I will be back. Thank you so much, Leya! Welcome back anytime. I would like to make a suggestion to add in a bit more details to this About page. I have this habit of finding out the personality of the writer after reading one of their posts. I think other readers of yours would also be delighted to get a glimpse of your life and know you more. Never mind me, if you don’t agree with me.